The best holiday homes have variety at their heart. Acting as a retreat from the hustle of everyday life, yet still offering fresh new experiences each visit and providing activities to entertain everyone. Which is why Trecco Bay is such a perfect choice. This large holiday park features a gigantic indoor pool, an outdoor splash zone, bowling, dodgems, even its own Blue Flag beach. But when it’s time to unwind then it delivers, with a scenic setting and peaceful countryside surroundings. The ideal year-round getaway for the whole family. Take time just for you, relaxing on a pristine beach and exploring remote countryside. Or have an action-packed day on-park with the kids. A new lifestyle starts here. 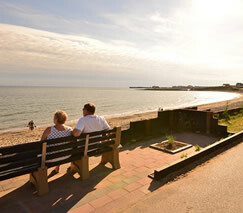 Porthcawl with its classic funfair, golden beaches and prestigious golf club is just a short stroll away. Enjoy direct access to Trecco Bay’s Blue Flag beach, where you can build sandcastles, surf or simply laze in the sunshine. An indoor pool with chutes and waterslides, adventure golf, sports courts, bowling… Trecco’s bursting with activities. Your new lodge features a well-equipped kitchen, spacious modern interiors and its own veranda for cosy, easy living.